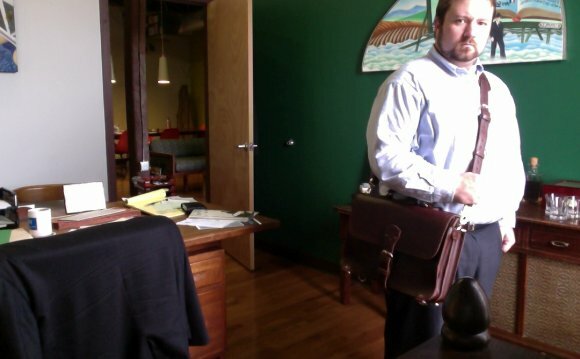 Editor’s Note: Dappered correspondent, Ben Madeska, has owned his Saddleback thin briefcase for three years now. Head here for the growing archive of these annual updates. Entering the fourth year with the Saddleback Thin Briefcase in Dark Coffee Brown, there’s really no novelty left in using it. It’s firmly entered “favorite old pair of jeans” territory. After three years of regular use it just works. It’s comfortable. I know what it can do, and what it shouldn’t do. The leather is really starting to break in in places and take on some character, but still is solid overall, even rigid. A loose thread I noticed in hasn’t even loosened any further. Having moved once again since the last update, this is now the third city and second state in which I’ve had this briefcase. It’s been used on multiple day and weekend trips. I probably won’t be taking it with me on long vacations anymore. I’ve taken it on a few longer trips, and it seems to be simultaneously too small and too big. It’s too small to be really useful for overnights, much less long-term travel, and I find it too big to be a handy second bag while on vacation. The classic briefcase would probably be a better choice for weekend getaways. This may just be me talking myself into getting a second bag from Saddleback. That list is rapidly looking archaic (Spiral bound paper calendar? Really?) but it’s not too far off from what I still carry. The laptop’s smaller and lighter now, and I carry fewer paper files with me. If anything, this briefcase is better able to accommodate my needs now than when I first got it. It’s the perfect size for trips around the city if I’m meeting people for lunch, going back and forth to my studio, or hitting a coffee shop to do some writing (as I currently am). Flexing and getting softer with age. Still tough as nails. This briefcase hasn’t really been abused Indiana Jones style, but in three years it has been tossed around, been in the rain and the sun, survived a few polar vortexes, and handles the bus and subway just fine. It has always protected its contents admirably. This is still a bigger, heavier bag though. I’m 6’4” so I tend not to notice the bulk, but other people comment on it (coworkers making exaggerated groans of effort when I ask them to hand it to me). According to Saddleback, with my height I could use the large size, which adds a couple inches to the dimensions and about a pound to the weight. The medium suits my needs just fine though, and I haven’t regretted choosing it over the large.